Want a nail polish advent calendar but don't want to splash out a whopping £50 for the Ciate one? Grab Studio London's 12 Days Of Christmas calendar instead for a budget friendly £8! Inside you'll find twelve mini nail polishes (3.6ml each) in an array of colours from nudes and taupes, to on-trend winter darks and festive reds and golds, plus four of which are gorgeous glitter shades that will be perfect for Christmas parties. 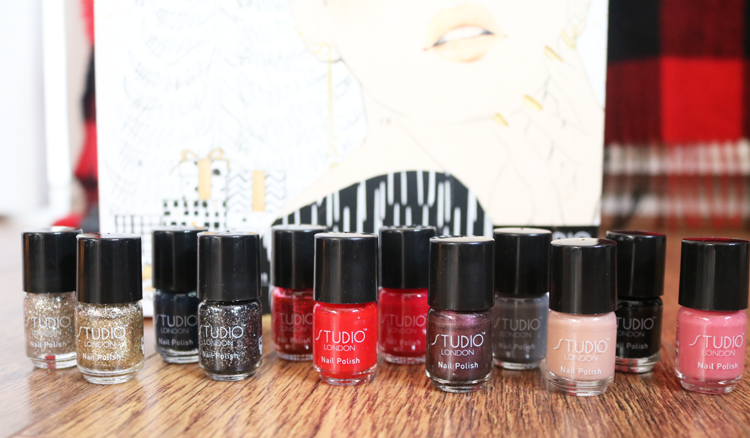 I have a couple of Studio London nail polishes in my collection already and they're really great quality for the price. Cruelty-free and the formulas are suitable for vegans too. Swatches from L-R: Tanya Burr Matte Lip in Christmas Stocking, Lip Gloss in Candy Cane and Lip Gloss in Berry Pavlova. There are three lip products (5ml each); Matte Lip in Christmas Stocking (a warm orange-red, super pigmented), Lip Gloss in Candy Cane (a sheerer pretty medium pink with shimmer), and Lip Gloss in Berry Pavlova (berry pinky red with more pigment and coverage than Candy Cane). All of these are sweet vanilla scented and feel comfortable on the lips. 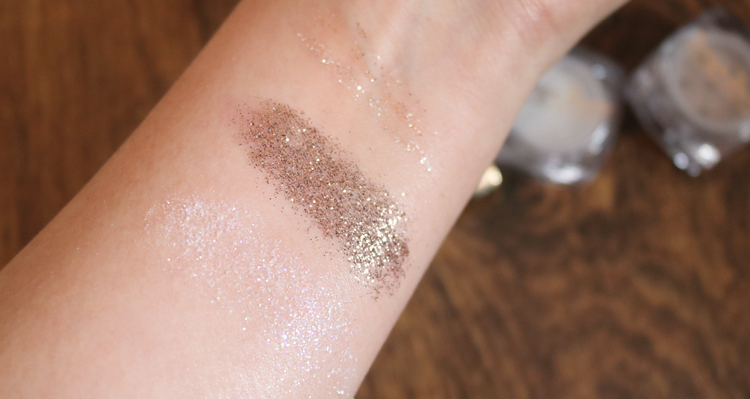 Swatches from L-R: Tanya Burr Eye Shimmer Pot in Snow Day, Eye Shimmer Pot in Champagne Sparkle, Glitter Liner in Ice Crystals and Glitter Liner in Treasured. For eyes, there are four products. The two Eye Shimmer Pots in Snow Day (loose white shimmer with holographic glitter) and Champagne Sparkle (loose metallic bronze with gold shimmer) are gorgeous (the swatches don't them justice! ), but the two Glitter Liners in Ice Crystals (silver) and Treasured (gold) are a little on the thin side, but work well when bulked up with the Eye Shimmers. A small mirror and nail file add two beauty accessories to the mix of products and are ideal for popping into your handbag. 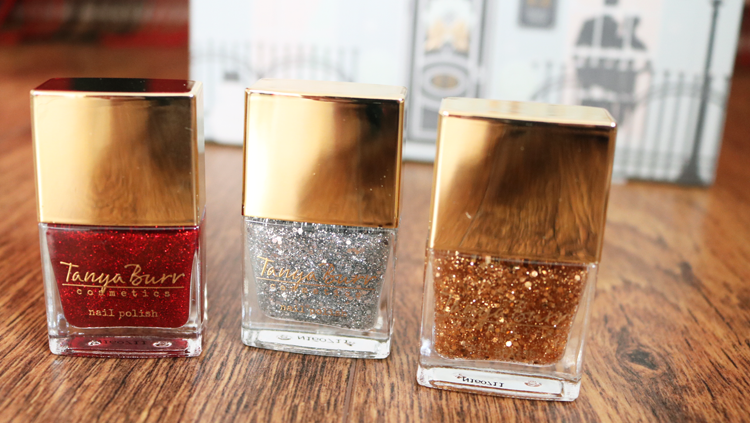 Swatches from L-R: Tany Burr Nail Polish in Sleigh Bells, Glitter Rain and Glitters and Gold. Lastly, there are three full-size nail polishes (9ml each); Sleigh Bells (a festive pinky red glitter), Glitter Rain (a silver glitter top coat) and Glitters and Gold (a gold glitter topcoat). Have you bought a beauty advent calendar this year?